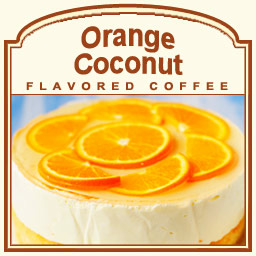 This Orange Coconut flavored coffee is for those that like their fruit flavored coffees with a zing! With an infusion of orange zest and sweet, flaky coconuts, this Orange Coconut flavored concoction features an intense brew that only has 2 calories of refreshing fruit undertones in each cup. Made with 100% authentic Arabica beans, the Orange Coconut flavored coffee has a gourmet taste that will perk up any monotonous day with its radiant flavor. 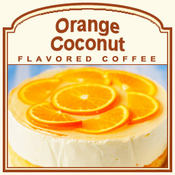 For those that like their coffee bold, the Orange Coconut will hit the spot. Roasted and shipped on the same day, this Orange Coconut flavored coffee will revive your spirit with each and every sip. Perfect served hot or cold, your Orange Coconut flavored coffee will be packaged in a heat-sealed valve bag to ensure optimal freshness in every delicious cup.